Where to start with my review? First off - to the author who has done a brilliant work, creating a fiction story in the midst of actual events. So many books were written about the Second World War but the author's research brought a brand new perspective to those events. I really have to congratulate her on creating such a lovely plot that mesmerized me from beginning to end. I really could relate to Tom, Mellie and every other character in the story. It was lively, filled with enough tension to keep you going and her writing was superbly done. This is a book I will recommend to all who loves a good plot, a very romantic story and strong characters. 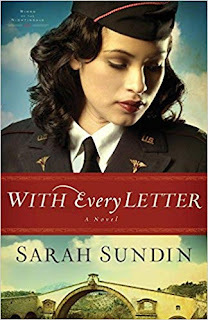 Throughout the storyline, the love for the Lord is tangible and real as you journeyed with the characters to North Africa during the tumultuous times of WWII. Every small detail highlighted by the characters own struggles as they trust the Lord for protection and leadership. In the process, you can literary see the Lord's hand in every situation without great difficulty. The easy flow helping along as it draws you deeper into the plot. I loved how both Mellie and Tom found their way through rejection, fear, the making of new friendships, being a leader and breaking the preconceived views of the groups they travelled with. Through their struggles, mercy flowed gently through the story with such ease that you cannot help but feel connected to every person involved. Beauty runs deeper than skin... that is very true in this story. When we look past the physical and connect, that is when we get to know each other... and this was clearly illustrated through the letters Tom and Mellie wrote. Through their anonymity, they could find common ground and learned to trust, cherish and love each other in a deeper way. In the end, the meeting between them was perfectly orchestrated to really bring it all home. This is a must read to all readers out there. And, I cannot end this review without mentioning Sesame's part in this story. Without giving anything away, his role was the perfect balancing act that grounded everything for me and I fell in love with him from his introduction. Lt. Mellie Blake is a nurse serving in the 802nd Medical Squadron, Air Evacuation, Transport. As part of a morale-building program, she reluctantly enters into an anonymous correspondence with Lt. Tom MacGilliver, an officer in the 908th Engineer Aviation Battalion in North Africa. As their letters crisscross the Atlantic, Tom and Mellie develop a unique friendship despite not knowing the other's true identity. When both are transferred to Algeria, the two are poised to meet face to face for the first time. Will they overcome their fears and reveal who they are, or will their future be held hostage to their past? And can they learn to trust God and embrace the gift of love he offers them?